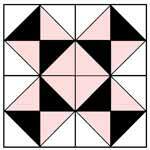 A variation of the “saw-tooth” patchwork, this lovely quilt was made for a bride-to-be and named “Union Square” because at that time there was a great deal of excited talk about Mr. Lincoln and the saving of the Union. 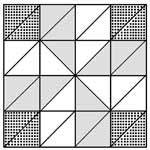 Number and Size of Block: 45, each 12 inches square. 3-3/8 yds.of 72" wide bleached white muslin. Wash before cutting to size. 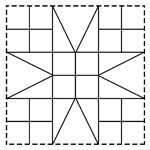 Starting at center with Red A units, stitch four together to form a block. 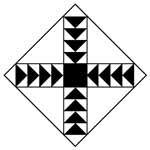 Stitch a White B unit	to each of the four Red units. 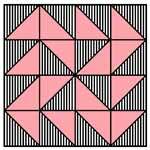 Stitch a Red B unit to each White B unit; then a Red A unit to each corner. Stitch a Red B unit to each of the Red units; then a White B unit to each of the Red B units. 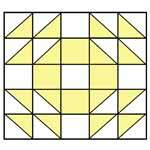 Finish block by	stitching a White A unit in each corner. Stitch 5 blocks across to make a strip. 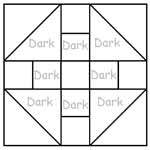 Make 9 such strips. 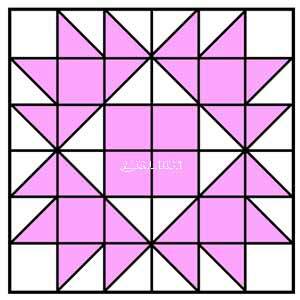 Then stitch these strips together to form the quilt. Cut material into 6 strips lengthwise, each 5 1/2 inch wide. 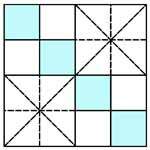 Stitch two strips together to form a said	border. Repeat for other side. 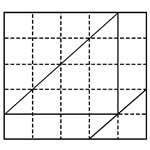 Use remaining strips for top and bottom borders. 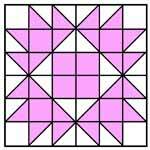 Find center points of border strips; and sides, top and bottom of quilt. Match center points; then stitch the strips in place, making 1/4 inch seams. Miter corners. 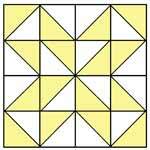 Quilt around each unit using a fine running stitch and matching thread. 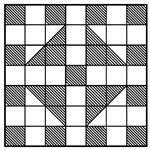 Quilt border in diamond pattern – diagonal lines crossing each other. 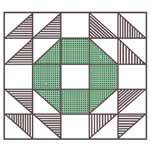 Click on image to print the 5" block of the Union Square Quilt Pattern.